Apologetics Press - Was the Darkness of the Crucifixion Merely an Eclipse? Was the Darkness of the Crucifixion Merely an Eclipse? For those who have experienced a total solar eclipse, the event is awe inspiring. Solar eclipses are incredible because they are a multi-sensory experience, from the amazing environmental changes of temperature and weather, to the sounds of nocturnal animal life, to the visual changes of the slowly dimming daylight and the brief darkness of totality. Lunar eclipses are similarly compelling as the Moon gradually changes from its usual bright white appearance to a more dim reddish hue. Yet, when we compare these physical events that have happened throughout history with the history changing event of Jesus’ crucifixion, can we understand the element of darkness on that day as an eclipse event? While this question has been posed by many people from many different contexts, we want to confront the reasoning of some who deny any supernatural descriptions for biblical events. This type of blatant denial of any supernatural elements is a ploy toward an ultimate denial of God. Rather, when we consider the historical reality and the blending of both God’s supernatural power with God’s establishment of physical laws, we find a full account that has both investigative and descriptive power to understand the unique events depicted in Scripture. As we discuss the timing of the crucifixion, we need to note the particulars necessary for solar and lunar eclipses to occur. First, a solar eclipse involves the Moon passing between Earth and the Sun, casting its shadow on Earth. This means that the Moon’s phase is always a New Moon during solar eclipses. In contrast, a lunar eclipse occurs when the Earth passes between the Sun and Moon, casting its shadow across the Moon. During a lunar eclipse the Moon’s phase is always a Full Moon. As an overview, here is the timeline for the relevant events of the crucifixion. According to Mark 15:25, Jesus was crucified at the third hour of the Jewish day or 9 a.m. which, from the context, we can understand as the initial placement of Jesus on the cross. Then at the sixth hour (12 p.m. noon) there came darkness over all the land for a duration of three hours until the ninth hour or 3 p.m. (Matthew 27:45; Mark 15:33; Luke 23:44). 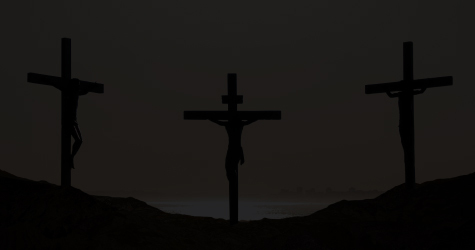 At this point, Jesus cried out three of His recorded sayings on the cross: “My God, My God why have You forsaken Me?” (Mark 15:34); “Father, ‘into Your hands I commit My spirit.’” (Luke 23:46); and “It is finished” (John 19:30). At the point of Jesus’ death, the darkness appears to have ended, as each account describes the darkness lasting for three hours, then Jesus giving His life. With the particulars of both the crucifixion timeline and the necessary timings of eclipses established, we can address whether a solar or lunar eclipse could be a possible explanation for the darkness that occurred. We can quickly rule out a lunar eclipse as the cause, since lunar eclipses do not affect the appearance of the Sun and would not have any impact during the time of Jesus’ crucifixion from 9 a.m. to 3 p.m. When we consider solar eclipses, there is a definite affect on the Sun and the daylight levels as they occur. Solar eclipses, especially in the narrow path of total solar eclipses, have dramatic periods of darkness. However, we can confidently say that the darkness during Jesus’ crucifixion was not the result of a solar eclipse event. This statement can be made based on the timing particulars that the Bible defines: first, the time of the month that the Jewish Passover occurs and, second, the duration of darkness outlined by the text. Jesus’ trial and crucifixion happened near the feast of the Passover, which occurs every year in the same month and the same day of the month. According to Leviticus 23:5, the Passover began on the evening of the 14th day of the first month. Important is the fact that the accounting of Jewish time is based on a lunar calendar, where each month follows the lunar cycle beginning on the New Moon. This connection can be seen by the Hebrew word often translated as month, chodesh, which originates from a root meaning “new.” In context, this word is either translated as “month” in regards to time, or as “New Moon” in regards to a physical description. We can see a use of the physical “New Moon” translation in the account found in 1 Samuel 20 involving David and Jonathan: “And David said to Jonathan, ‘Indeed tomorrow is the New Moon, and I should not fail to sit with the king to eat. But let me go, that I may hide in the field until the third day at evening’” (20:5). Here we have the New Moon (chodesh) used in conjunction with a time period of waiting till the “third day” of the month. Thus since Jesus’ crucifixion happened near the middle of the month at Passover, the phase of the Moon was near a Full Moon instead of a New Moon, which is the complete opposite for a solar eclipse in apparent and physical orientation. When we reach the climax of God’s plan at the cross, we see God using all elements of the event to highlight the incredible uniqueness of Jesus’ innocence, sacrifice, and love. One of these elements was God causing a great, supernatural darkness to cover the land and extend to the point of Jesus’ death. This darkness was not a simple coincidence, nor was it simply some usual event. Rather, it played a part in showing those at the cross then, and those who come to the cross today, the crucial message of salvation that Jesus brought to the world. 2 Jean Meeus(2003), "The Maximum Possible Duration of a Total Solar Eclipse," Journal of the British Astronomical Association, 113:343–348, December.